Lightweight flywheel for 1993-1995 E34 M5 3.8l (Euro-spec) only and all 535i - 5-speed or 6-speed. Tipping the scales at only 12lbs, this steel flywheel clutch disk, pressure plate, and throw-out bearing from the 3.6 liter E34 M5. Quicker acceleration and easier rev-matching. 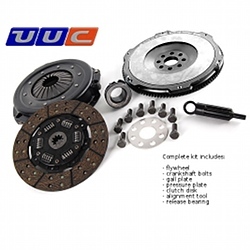 UUC customers have been using the 3.6l M5 clutch setup in turbo or supercharged M3s and MZ3s with fantastic results. Our own testing has shown the OE M5 clutch to reliably handle in excess of 450hp and our upgraded performance versions are capable of even more.